“The cost of the work is £2,275 and we have received a grant from WMT for which we are grateful. There will be a slight increase in costs for further stonework. 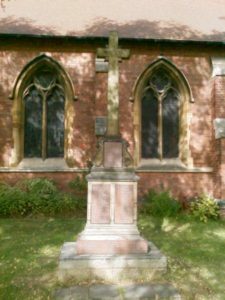 As the Memorial belongs to the People of Hexthorpe and as it was built from public subscription the PCC are asking parishioners in Hexthorpe to make up the shortfall of £1,000. We are hoping to raise this by donations. The church council of St Jude’s Church has been given permission to refurbish the war memorial in the churchyard. The names of the local people who were killed in both world wars are to be highlighted in gold leaf. It has taken 18 months for the go ahead to be given. It is a very appropriate time to do this as 2018 marks the ending of the First World War. The members of the Parish Council are to be congratulated in taking this initiative. The bulk of the cost is to come from a grant from the War Memorials Trust. However, local people are most welcome to make donations.